(Nanowerk News) The organic light-emitting diode, in short OLED, is characterized by specific features, which distinguishes it significantly from other light sources. The OLED is able to light up the entire area, whereas light bulbs, energy-saving lamps and classical LED are point light sources. It allows for transparent light sources with very low energy consumption, which furthermore can be applied to flexible and pliable substrates. The innovative world of light and design possibilities related to this progress had an important influence on the efforts for the development of OLED lighting technologies worldwide. The progresses of the last five years have proven the technical feasibility of this vision in the form of first flexible demonstrators. 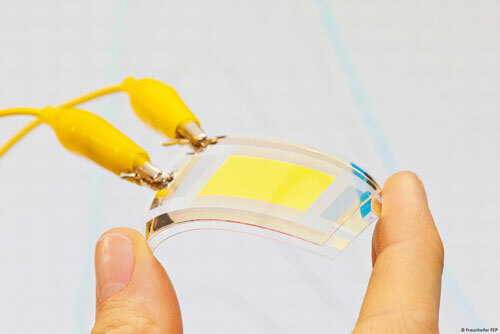 In the meantime leading lighting manufacturers have established pilot fabrication capacities for lighting-OLED on rigid glass substrates, e. g. the consortium partner OSRAM OLED. A significant penetration of the general lighting market can only be achieved if on the one hand the hitherto high production costs for OLED lamps can be reduced and on the other hand new fields of application and design can be opened up, which could not be served so far. The combination of the specific design characteristics planarity and flexibility with cost-effective manufacturing techniques provides an even economically promising alternative to the established lighting technologies. The system integration of the manufactured flexible OLED modules for the use in automobiles, aircrafts and household applications is one of the main subjects of investigation within R2D2. According to the demands of these application fields durable, highly efficient materials, assembly and connecting technologies adapted for each application as well as system integration technologies will be researched and investigated. With the participation of Novaled a worldwide leading expert for OLED materials and technologies is member of the consortium. Moreover the consortium will be supported by VON ARDENNE GmbH, which is one of the market leaders for equipment for the highly productive roll-to-roll coating of flexible substrates and thus ensures the industrial feasibility of the developed technologies. Application and product studies including a detailed analysis of the manufacturing costs will be compiled. The consortium would like to thank the BMBF for the project funding, which provides a subsidy of EUR 5.9 million over a period of 2 years. The project consortium covers the entire value chain between material research, plant construction, component technology and application studies for future products. The planned activities are based on the worldwide recognized results of the BMBF-funded projects R2Flex, So-Light and TOPAS2012 for the organic electronics (especially organic light-emitting diodes and organic photovoltaics). The direct participation of major lighting manufacturers (OSRAM OLED GmbH) and end users of the light sources (AUDI AG, Hella KGaA Hueck & Co and Diehl Stiftung & Co. KG) allows for a fast and comprehensive utilization of the project results, which affects the entire value chain by new possibilities of market penetration. R2D2 helps the organic light-emitting diode to gain a higher degree of reputation in the general public for the use in lighting applications and leads to a technological progress, which gives an economically important competitive advantage to German companies. – Hella KGaA Hueck & Co.